I grew up doing it all - playing every sport I could, dabbling in musical instruments, camping with the Boy Scouts, collecting rocks and coins, and amassing grass stains. But my favorite activity of all was being "knee deep". The creek that ran next to my house was a virtual paradise for a young explorer. I remember creeping through pools catching crayfish, building dams, and catching trout on anything we could. As I grew older, my love for being knee deep never changed. I spent a lot of time learning the art of fooling Penns Creek trout as well as finding giant smallies in the Susquehanna and Juniata Rivers. In college and grad school, I pursued environmental degrees and always tried to do as much "field work" as possible. It was actually during college that I found out my childhood dam building was technically illegal. It turns out that building dams of a certain size on native trout streams is against the law in Pennsylvania. Thank goodness our cobblestone concotions were constructed with the engineering knowledge of 10 year olds and made no serious impact. Now I do most of my fishing from a kayak. Those that fish with me will probably note how often my legs are draped over the side of the yak and dangling in the water....even in mid-January. I guess you could call this being shin deep. However, from time to time I escape to one of my favorite rivers here in North Carolina and I don't take my paddling gear. This particular river cuts through Durham and resembles a trout stream more than a bass haven. It is perfect water to wade and chase largemouth and Roanoke bass. It is where I cut my teeth when I moved to Durham a few years ago and a river I don't visit nearly enough these days. But this past weekend, a good friend gave me a call and asked if Mary May and I wanted to wade for a few hours. I was excited at the idea of revisiting an old haunt - one where I had caught many a largemouth in the past. Mary May was more cautiously excited. Her dislike of snakes always makes her a little cautious when committing to a wade trip. I assured her that we probably wouldn't see any snakes as we loaded the car and headed south. It was amazing how much easier it is to pack for wading than for a day of yak fishing. On Tuesday this week I busted my hump to get work knocked out early so that I could escape to the river for a few hours in the late afternoon. Nothing makes me long for a fishing trip more than staring at a computer screen all week. This time I headed out solo to explore a stretch of river I hadn't fished in well over two years. It is a boom or bust area that requires a long walk and some hard wading. It was weedier than past trips, which made the wading even tougher. Bream and other creek minnows darted in and out of grass clumps as I waded. I would cast to holes in the grass mats, which typically returned bites from bream or small bass. Finally, I got to an area where the creek bottom became rocky and the weeds subsisted. I began casting to shady areas, deeper pools, and wood cover and was regularly enticing bass in the 10"-14" range. Then I got into a stretch where the Roanokes seemed to be everywhere. Most would grab the tail of my 5" plastic worm and run with it, without ever getting the hook. However, some of the bigger fish did come to hand, including the biggest of the day. He had a huge head and would have been VERY impressive in the early spring when they are fattened up. The rest of the day was hit and miss. My two favorite brush piles had been wiped out by high water, so I focused on fishing slow through some deeper troughs. I was landing bass, but none over about 2-2.5 lbs. Eventually I reached my usual turn-around spot, but since I had a little extra time I decided to keep going. I stopped in a stretch with a nice, long riffle and hunkered down on a large, mid-channel boulder. I caught up on emails and lit a cigar I had picked up at a wedding last month. I smoke about a cigar a year, but the sweet smell of the smoke seemed to fit with my surroundings. I have no idea if it was a "good cigar" by traditional standards, but at one point I had dragonflies land on both shoulders, so I will take that as mother natures way of saying that it was. After I had my fill of the cigar, I dipped my head in the water and trudged onward. I managed two solid bass near a log in the next pool, so naturally, I kept wading. Unfortunately, I wasted the next 40 minutes wading down - and then back up - a shallow, weedy stretch that tested my ankles and shins. Deflated, I kicked it into overdrive and headed back toward the car. A storm was blowing in and the sky was getting dark very quickly. I did make a few casts to prime looking spots and ended up with a few more small bass. By the time I reached the parking lot, my legs were exhausted and I was more than ready for a glass of cold lemonade that awaited me at home. The big bass I was hoping for didn't pan out, but I did end up with 27 fish - 6 Roanoke bass, 1 bream, and an even 20 largemouth. I had no complaints. Although wading isn't for everyone, I do strongly recommend going knee deep...at least once. Until next time, tight lines! In my previous blog, I mentioned that a giveaway was coming this week. Well, it has arrived. The easiest way to get involved is to go to Facebook and "Like" the giveaway post on the Quest for the BASS Slam page. You can get there directly by clicking this link. And as I previously mentioned, if you do not have Facebook, just comment on this post or shoot me an email (drew@manpoweredfishing.com) to be entered. Tight lines! After a lot of time and effort, it is finally done! Episode 1 took us to central Florida to fish some rivers that were very different than the norm for us. And despite tropical storm Beryl's best efforts, we had a blast! Comments, questions, suggestions...please chime in. Enjoy! Today was supposed to be the "release party" for Episode 1 of the the BASS Slam. That isn't going to happen. Trust me, I was as excited as anyone...probably much more so. Due to the high resolution video, it is taking FOREVER to upload to my YouTube channel. Currently, the total upload time is looking like 14 hours and 22 minutes...bummer! On another note, we haven't forgotten about the prizes we promised back at the end of May. The problem is that due to lack of clarity in the original post, no-one qualified. Again, this was our fault for not being more clear, especially because our post on the Malibu Kayak Facebook page was difficult to find due to the way they have their site organized. I know a couple folks went out of their way to like the majority of those pages and one person even signed up for the Team MK page. We REALLY appreciate everyone who is following along and/or interested. This has been so much fun that we just genuinely want to share it with folks. So, we are trying to re-work the giveaways into the easiest possible format. On Wednesday we will put a link on our Facebook page that says something like "Want to win free fishing gear and guided trips? "Like" this post to enter. "Share" this post and we will be extremely grateful." If you are interested in entering the contest and do not have Facebook, we do not want to leave you out. Please respond to this post or shoot me an email to put your name in the running. And last, but note least, Malibu Kayaks is not going anywhere! A lot of rumors have been floating around and a lot of folks have assumed MK is dead. Well, you are wrong! It certainly hasn't been easy for them and things are not back to normal, but progressing is being made. MK is working extremely hard to get caught up on orders and get things rolling with new, innovative, and awesome designs! It has been a crazy couple of months and both the company and pro-staff took some lumps. Although all the news hasn't been good (a couple awesome members of the pro-staff are moving on), I expect a very bright future for Malibu Kayaks! My full Stealth 12 review is right around the corner! If you Google - "New River, body found" the first few pages are filled with scary/unfortunate/humbling results. The reality is that water takes lives. In a post last week, I wrote about some of my views regarding saftey on the water. This week, I will add a couple more and give boaters (especially new ones) a few links to check out that may be informative for them. Every time I hit the water, I am sure to have 6 things - a life jacket, whistle, light, first aid kit, knife, and gorilla tape. These items are my "safety" items in case I get injured, lost, or simply fall-in. Gorilla tape will also patch a hole in a boat. The life jacket (aka PFD) is the real life saver, but you never know when the others might be needed. In fact, in many states, whistles and lights are required for non-motorized boaters in addition to PFDs. Be sure to check your local regs. 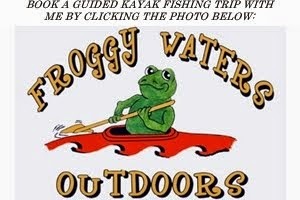 Another quick Google search will yield about a million kayak fishing saftey tips, but one of the most informative is this one from Paddling.net. You might notice that they use the phrase, "don't be stupid" a lot. Take their advice! Thankfully, I have never had a MAJOR issue with a motor boat putting me in danger. And although some people seem to peg them as public enemy number one for yak anglers, I have found that most of the yak anglers I know rarely have issues with bigger boats. If they do, it is typically an issue with the bass boat guy thinking they own the lake and not respecting the personal space of the kayak fisherman - especially in a tournament situation. For those of you who are bass boat guys and might read this, there are plenty of great sites out there for boater safety as well. In fact, many states are now requiring safety classes for younger boaters. One great site for info, practice exams, and much more is BoaterExam.com. It has great info for folks in North Carolina, Virginia, and more. In fact, you can get your Virginia (and many other states) boating saftey course and license completley taken care of on their site. Kayaking, canoeing, and boating should be about having fun, relaxing, and enjoying nature. I hope none of my readers ever have to deal with saftey issues on the water. But one of the keys to prevention is planning ahead and being prepared. Be sure to check back Monday...it is finally time for Episode 1!!! Until next time, tight lines! A few months ago I was in the market for a new spinning reel. One of my previous reels had met its fate at the bottom of a river. The other took the brunt of a fall while doing some wading. It was no match for the rock it connected with at full force. After shopping around, I decided to try out the Abu Garica Orra S. It is a new spinning reel and has a lot of features, as well as a very palatable price tag. Immediatlely I was impressed by how light and smooth it was. It also has a very sturdy build and is pretty sharp looking to boot. I bought the size 30 and spooled it with 8 lb Seaguar fluorocarbon. The drag felt smooth and it paired very well with my Carolina Custom Rods shaky head/drop shot rod. 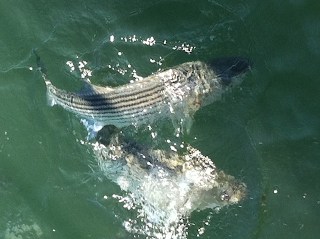 Over the course of a number of trips, I have caught bass ranging from 10 inches to 6 lbs. I have also caught catfish up to 24", a 26" bowfin, and a number of panfish. I was amazed at how well the reel managed each. A lot of spinning reels fall into categories. Either they handle larger fish well, but aren't very sensitive for fishing light lures or they are very sensitive for fishing small baits, but have issues when it comes to handling bigger fish. I thought for sure the bowfin would break my line, but it didn't. I also thought the 6 lb bass, which was caught near some vertical pilings and cables, would get wrapped up and break me off, but it too was landed. With the Orra S, I was able to control the fish and also not break the line. Granted, some of this is due to the rod and the line, but the reel plays an underrated role in fighting big fish. A couple months after I bought this reel, I ended up having one of my older spinning reels also get mangled. I put in an order for two more Orra S 30's - the second of which will go on a spinning rod that has needed a reel for about a year now. As many of you know, I get very wrapped up in choosing my gear and when I find something I like, I stick to it. This reel has REALLY impressed. I will note, there are a few features on this reel that could be upgraded - particularly the screw in handle. And of course, only time will tell how the finish and parts hold up. But so far, I can't say enough about this reel, especially at the $70 price point. Check it out! I haven't been on the water much lately between travel and work, but this past weekend Mary May and I headed north to Virginia to fish in the New River Open. The tournament was part of the larger New River Fest 2012, which included a number of other events and competitions. I had never really fished the New, so I was eager to see what it had to offer. A decade ago, it was one of the best smallmouth fisheries in the country, but recently it has struggled. It is rebounding, but reports going in were that big fish are hard to find. Mary May was equally excited about fishing her first ever tournament and also getting to float a river with some significant rapids. We got to VA around 10 PM on Friday night and headed to our campground. I should note that this area, and much of Giles County, was without power for over 8 days due to the incredible storms they had the week prior. So, we were without power for our stay, which made things a little more interesting. Also of note was that the campground was flanked by a railroad track, which had been blocked by downed trees much of the week. Of course, the night we arrived was the first time it had been used in nearly a week and they were making up for lost time. It made sleep difficult as trains rolled by throughout the night. But we savored the sleep that we did get and were up early to go to the captain's meeting. The one real bummer about the weekend was the captain's meeting. It was held at 7 AM the morning of the event, so we missed out on the morning topwater bite and had much less time to float our stretch - considering it was light at 5:30 AM. Regardless, the folks at New River Outdoor Company were great and did a great job with the event. They set-up categories for both inviduals and teams in smallmouth, musky, and panfish categories. We picked up our identifiers, went through the rules, and headed to our launch. We put-in north of Parrott, VA and floated down to the campground where we were staying - about 3 miles total. The river was packed with folks all day - fishing from motor boats, yaks, and canoes or wading. It was one of those days where I wish I would have had a practice day previously, because as we found out, the river can be tricky. We quickly encountered a class II rapid that included a 2 foot drop and then a second of about the same height. Below this rapid came the worst part of our day. Mary May was fishing a large eddy and her bait got snagged. She couldn't get it dislodged or break the line and was being pulled toward the rapid. She did a great job staying in the eddy, until suddenly a whirlpool area caught the back of her boat and sucked it under. It knocked her out of the boat and treated her to a nose full of water, but the yak did stay upright. She made a swim to dry land while I grabbed her boat and towed it over. We were both a little shaken up, but to her credit, she really hung in there and was willing to keep at it. I can't credit her enough for hanging in there. The second worst part of the day came about 100 yards down river. We pulled our yaks onto some rocks about 30-40 feet off of the bank and began wading out to fish a couple big chutes. We had avoided these rocky, technical class II chutes in order to take the safest route. As we were walking I heard someone yell out to us, so I turned and saw a man who had driven his golf cart the roughly 50 yards from his house to the river bank. I turned and walked past the boats to shore to see what he wanted. He asked why we had pulled up there and if we had seen the no trespassing signs. I told him that we had not seen the signs (because we hadn't been very close to the bank), that we wanted to avoid the rapid because Mary May had just had a rough experience with the previous one and that we had pulled the yaks up on the rocks to fish the pool below. His response was that what we were doing was "docking". My response was that we were sorry and that we had assumed that being well off the bank was OK and that we would fish it for a minute and be off. His response was, "Well, you aren't doing anything wrong, but the signs say no-trespassing." I sat for a second, trying not to contemplate my response the oxymoron. He clearly wanted us to leave, yet also told us we weren't doing anything illegal. My adrenaline was already pumping after Mary May's spill and I didn't want to escalate the situation. I re-iterated that we were well off the bank in order to avoid any land ownership issues and asked if it was OK if we stayed there long enough for a few casts. He mumbled something to the effect of private property again, including something about there were plenty of places to cross the rapids. Being perfectly honest, the only other easy spot was on the far side of the river (and the New is a wide river). Much of the rapid was fast, rocky, and technical. It was not meant for a beginner who was already a little shaken-up. I apologized if we intruded on his land and went back out to tell Mary May it was time to keep floating. Those of you who know me well know how rare it is for me to lose my temper. But that guy almost caused me to do it. I understand the rights of property owners and river etiquette quite well and never have I felt as slighted by a land owner. Anyway....back to fishing. It took until about 11 AM before we figured out a pattern. The pattern was don't bother with anything but plastics. The fish didn't care about spinnerbaits, topwater, jerkbaits, or any other hard baits. I think crankbaits would have worked better, but most of the river was too weedy to throw them. We finally found a deep ledge and started catching fish regularly. Mary May was nailing them on a 4" stick worm and I was using a 3.5" tube - both in green pumpkin. We landed a bunch of smallmouth bass under 11" and a few rock bass. Thinking that we were on to something, we didn't measure one of Mary May's rock bass that was probably around 7.5". This would come back to bite us later. Hey, ya gotta start somewhere! A short time after this, I switched to a drop shot and that is when the fun really began for me. The smallies were crushing the rig - which included a 1/8 oz weight below a 4.5" Roboworm. Mary May was still getting bit too and we were having a blast. We landed some nice smallies and small rock bass between then and 1:30 PM, when we arrived at the take-out. Unfortunately, I lost a big smallie about 1/3 mile above the take-out because I didn't re-set my drag. That would also come back to bite us. We also had to skip some great looking water because we were running late for our shuttle. As I finish writing this paragraph, I am realizing how many things really did not go our way. It turned out that our shuttle was also late and we had to really hurry in order to make it to the weigh-in on time. We just made it and checked in our fish. After the NROC folks looked at the photos, they announced the winners. I should note two things here. First, there were over 50 entrys and we were the only non-locals. Second, we were the only entrants to not be fishing out of motorized boats. As they announced the winners, we found out that in the team division we had missed third place in the panfish category by 1/4" and the smallmouth category by 1". Had we measured Mary May's biggest rock bass, we would have been either 2nd or 3rd as a team. And had I been able to land that smallie, we would have been in 3rd place as a team. Although we were a little bummed, we were very proud of our finish. In the invidiual division, I came in 4th in the panfish cateogry and around 6th in the smallmouth category. There were some impressive fish caught, including a 20.25" smallie and a 10.5" rock bass. There were also a couple musky over 45" that were landed. Although we didn't come away with prizes, we did have a great time and walked away very happy (albeit exhausted). We caught a pile of smallmouth and learned a lot about the New River. I don't think this will be the last tournament we do together. I was also really, really impressed by how the Stealth 12's handled that river. I can't say enough about how much I like these boats. Before I wrap this up, I want to mention one last thing. We found out at the weigh-in, that a man had died on the river that day about 10 miles from where we were. They found his body in 14 feet of water. They believed he stepped off a rock and got swept away. He was not wearing a like jacket. I do not know if alcohol was involved, but I know we saw a TON of folks drinking on the river. I don't want to get up on my soap box for too long, but when you are on the water - especially rivers with class II-III rapids like the New....BE SMART! Always wear your life jacket and save the drinks for the end of the day on dry land. It pains me to see folks not wearing their PFDs when fishing big rivers (or lakes). And I know way too many folks that regularly drink or do other illegal things on the water. Please, use your head when kayaking/fishing and always air on the side of safety. A huge thanks to Mary May for fishing with me and being a trooper...not to mention soar lipping plenty of bass. This is going to be another crazy work week, but hopefully I can find some time to hit the water soon. Until then, tight lines! I apologize for the total lack of posting lately. Work has been on overload and we have been traveling on the weekends. However, Mary May and I did hit the water this past Saturday in our first ever tournament together. That blog, discussing our New River adventures, will be out tomorrow. At a seaside restraurant in Noank, CT (near Mystic), the stripers favorite food seemed to be oyster crackers. 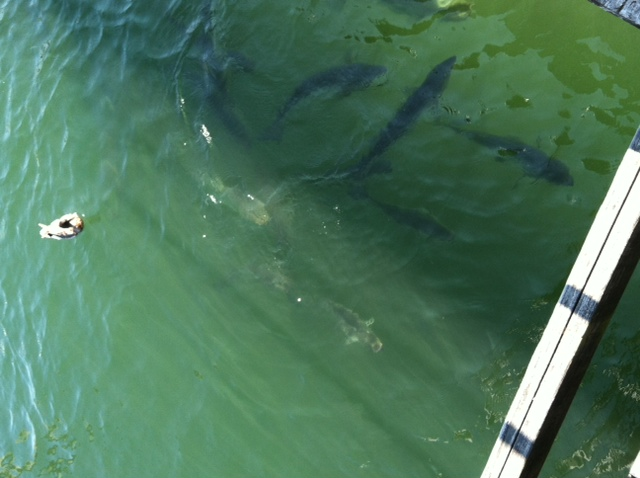 Although, they ate just about anything we tossed in. 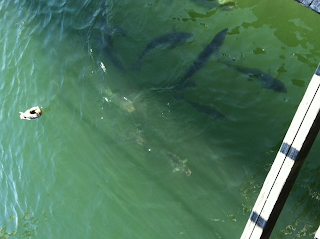 The biggest looked to be about 25 lbs and there were roughly 20 in the school. And of course, the human food was pretty darn good too. 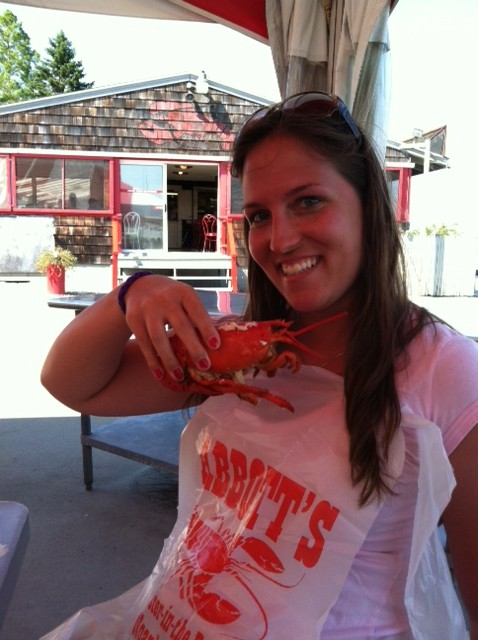 I am missing the steamed clams and lobster already! I gorged on the ridiculously cheap lobster and seafood during the entire trip, and created what Evan Howard deemed the "Lobster Slam". I think MM and I ate lobster 8 different ways....not too shabby. I should also note that I had a birthday last week - one year away from the big 3-0. Thanks to MM, I picked up another hobby...one that I have been wanting to pursue for quite some time. 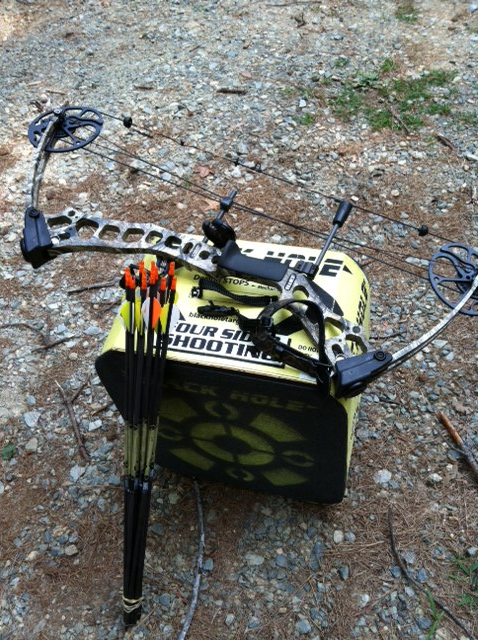 A couple days before my birthday, we headed to Buttermilk Creek Outfitters and picked out this beauty - a Mathews Mission Riot. 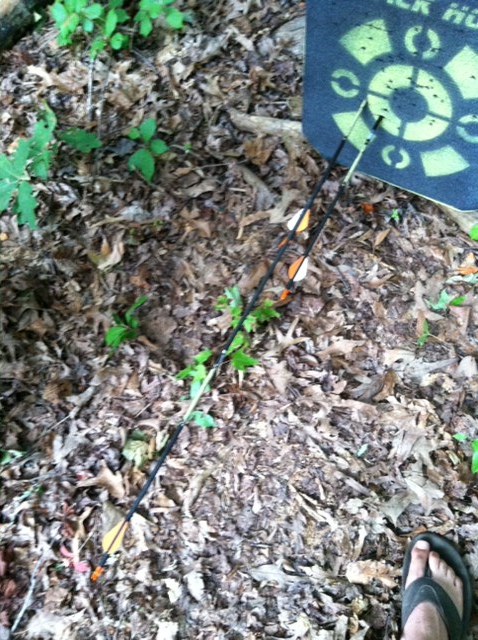 And on the first night of shooting, I managed this crazy feat - a Robin Hood (shoot one arrow directly into another). 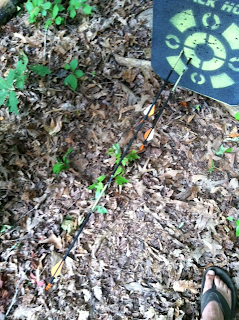 It happened while shooting a set of 3 from 30 yards. Hopefully it is a sign of things to come! Until tomorrow - tight lines!